Having had the trail cameras out and about at various times and locations, I thought I would put up a gallery of some of the more interesting images. Note if the Loch Ness Monster is in any of them, I can't see it! You can click on each image for more detail. First we have a pleasant day at Loch Ness with some people out on a fishing excursion. However, Highland weather can be quite temperamental as this next shot shows. Not quite great Nessie spotting weather. The next picture is one I was hoping wouldn't happen but then again, I am half glad it did. Someone had found my trail camera but clearly they left it else I would not be showing you these pictures! So I thank the person for their honesty but clearly I will have to find a more covert location. I though it was well embedded and out of the way from tourists but then again, those boats I just showed could possibly notice it from afar and come back later to investigate. As is usual the loch stirs itself and begins to attack the shoreline. The sky begins to darken and the loch becomes more unsettled and harder to interpret. Is that a long hump at the centre left or just a wave? The next camera I put on the roadside for one night just to see what happened as darkness descended. As it turned out a UFO (Unidentified Furry Object) came into view at midnight. I must admit I have no idea what it is. Perhaps a fox or rabbit? Too small and furry for Nessie, that's for sure. I then moved the camera to a spot just north of Fort Augustus. Things got interesting when this critter turned up at 10:36pm. "What was that little red light I just saw?" "I think I better investigate this ...."
"... and give it a good sniff." I was wondering what this "UFO" was. A ferret, polecat, weasel? Actually, I think it might have been a Pine Marten which is itself not a common creature. It seems our Loch Ness animals are pretty aware of these devices, which I don't mind so long as they don't sit in front of them all night! More pictures as and when interesting things pass in front of them! 'UFO' number two is definitely a Pine Marten! Beautiful creatures, and, as you say, all-too rare. Furry intruder number one looks to be a fox, which is pretty darn cool too! That's one of the joys of Loch Ness for me. Regardless of the presence (or otherwise) of Monsters/Orms/Kelpies etc, there's NO question that the place is teeming with rare and beautiful wildlife. I saw my first red squirrel close by the Ness. That was right up there with Nessie itself for me! Wow, great pine marten shots! That is very exciting. 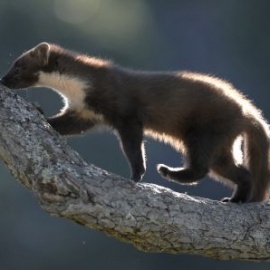 Great pictures - the pine marten shots are fantastic, and are almost a test run, and a successful one at that. This is my first time on the blog in almost a month. I'm in Guatemala City today after almost a month in the country, and head back soon. Glad to see you're starting in on the land sightings -- truly the close encounter of the 3rd kind and high strangeness you mentioned. Best regards and glad to see the blog in full swing! Actually, funny you should ask. I'd run across reference to a monster in Lago de Atitlan, a pretty large lake, some 12-15 in diamater, where we spent almost two weeks. I asked one my Spanish teachers about it, and he told me it's definitely a real animal! Him and my other guide were both of Mayan ethnicity and culture, and both said people have seen it, and that it is a protector or "dueño" (kind if an owner) of the lake. My teacher in particular had no problem explaining it as being both a spirit and flesh-and-blood creature. Two people described it to me as being like an alligator, though my teacher said it had appeared at times like a serpent, or with the head of a horse, but with hair - which I gathered to be like a mane. The spiritual element connects it, in my mind, with the Highlander's traditional views of the water horse - like when Lord Malmsbury stalker said that it's diabolical, and that only one exists at a time. My teacher also mentioned that the creature shows up when their are events or challenges to the lake - like an algal bloom that covered much of the lake several years ago. Had it been seen recently, I asked. It had been a number of years, "muchos años," he said, since he'd heard of a sighting. I was fascinated to say the least. I ended up collecting quite a bit of folklore here, both orally, but several books as well (and by folklore I don't mean to imply 'not real'). A folk tradition, similar in some ways to the fairy faith in some ways, is alive and well here. I might add that it was a bit disconcerting to be standing up to my neck in the water of the lake when my teacher told me about the horse-headed serpent that lives there. I stood on a projected rock, and the lake, which has volcanic origins, plummets quickly and steeply into the depths. Underwater, I could see the pale rocks fading into the depths. It's the deepest lake in Latin America, more than 300 meters in places. Great stuff, especially the Kelpie-like elements.